The Committee, members and friends of Abergavenny Road Club extend a warm welcome to competitors and supporters to Round 8 of the Welsh Cyclo-Cross League 2017, which takes place in the grounds of King Henry VIII School, Abergavenny, NP7 6EP on Saturday 28th October 2017. Special thanks go to our club members and friends of Abergavenny RC who give up their time to make this event happen. Without their support it would be impossible to hold. 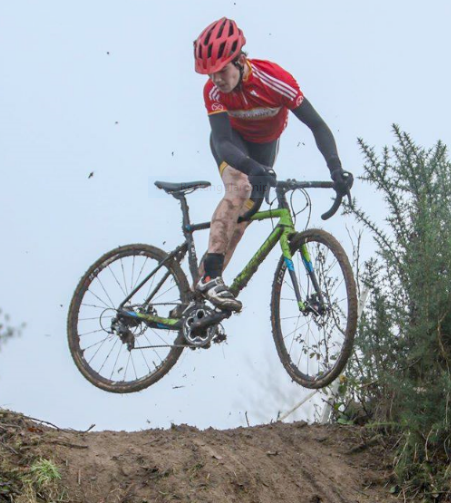 Abergavenny Road Club is one of the foremost cycle clubs and Round 8 of the Welsh Cyclo-cross League 2017 is part of our “Crosstober Wales” festival. We do hope you enjoy your time in “The Gateway to Wales”. David James, Cwmheulog, Llwyndu, ABERGAVENNY, NP7 7HY. Toilets/Showers: Leisure Centre, Old Hereford Rd, Abergavenny, NP7 6EP and various portaloos around the site. There is free internet access, a café and vending machines at The Leisure Centre, while Abergavenny town centre is a short walk away. Cyclists are invited to set out their own facilities in the Tennis Courts next to the Leisure Centre, to use as a warm up area. There is a designated pit wash area and there is ample water available on site. Competitors can drop off equipment adjacent to this area, but will be expected to park in the designated areas. There are toilets and showers at The Leisure Centre for use by competitors and visitors. First Aid will be covered by Outdoor Medical Solutions, who will be on site 9am to 6pm, and will be based in the Event Village, near the podium vehicle. In addition, all of Abergavenny Road Club’s coaches have current First Aid Certificates. All of Abergavenny Road Club’s volunteers will wear a reflective tabard when on duty. The nearest hospital with a 24-hour A & E Department is Nevill Hall Hospital, Brecon Rd, Abergavenny, NP7 7EG. Tel 01873 732732. The hospital is around 3 minutes by vehicle. In the event of a serious accident, Abergavenny Leisure Centre will be informed to ensure compliance with site H&S procedures. From M5 southbound: exit junction 8, Follow M50, then A40 to Abergavenny. Head towards town centre and follow signposts for the Leisure Centre. Trade, Camper vans and VIPs will be directed to the parking in and around the Leisure Centre and School. You must provide identification if asked for. 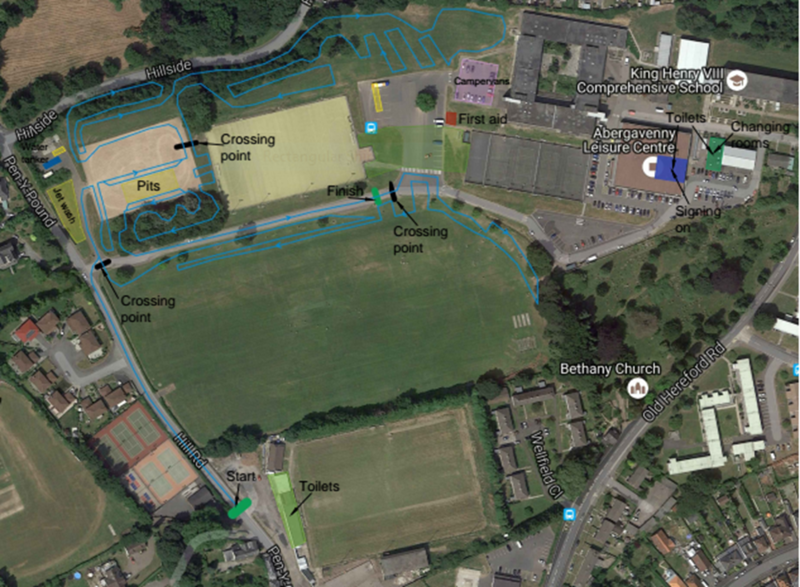 Competitor Parking: Lower Field accessed off the Old Hereford Road and just 30m from the start line. 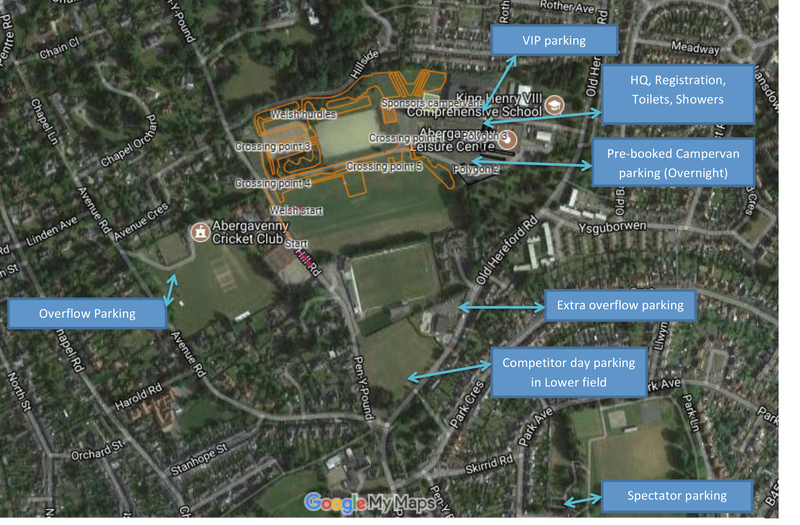 Spectator Parking: Fairfield Car Park Car Park (pay and display), only 5 minute walk from the venue. Please follow our parking guidelines and do not park in adjacent streets. Sign on will take place in the Leisure Centre Café, which is on the first floor, starting at 08.30 and remain open until 12.00. Disabled access to this location is via the internal lift facility. A valid racing licence must be presented at sign on. You will receive a body number, which must be pinned to the LEFT side of the lower back, and an arm number to be pinned to the front of the LEFT arm. Sign-On for each race closes 30 minutes prior to the scheduled race start time. Please bring your own safety pins. Transponder timing will be used for all categories apart from under 12’s and Novice Women. Transponders will be issued at sign-on and should be attached to the ankle using the strap provided. Please remember to return the transponder after the race. DO NOT DOUBLE BACK AFTER PASSING THE FINISH LINE AS YOUR FINISHING POSITION MAY BE AFFECTED! Riders will form up and start the race on the West side of the sports field. A minimum of 40 riders will be seeded and this will be based on Welsh League Standings. If you miss your seeding you must not force your way forward and you will start from where you are at the time. Entries on the day will not be seeded, unless they are known to have previous exceptional race performances. The course is contained entirely within the school grounds with barriers placed on the main straight, pit area and around the Event Village: all two-way sections will be staked and netted and the remaining course marked by tape. After a long straight the riders turn right and join the course proper and continue around the sports field to join the technical part of the course which is 2.8 Km in length and often winds through the trees. There is straight section of tarmac (finish straight), then you join the section around the sports field and the start of what has become a closed circuit. All crossing points (marked in black on the map) will be marshalled by small teams of two or three volunteers, all wearing reflective tabards. There is a Bike Wash Zone near to the pits. During the races, pit crews are asked to wash the bikes in the wash zone and not in the pit lane. The organisers will not be supplying high pressure hoses, hose pipes or buckets. Riders/pit crews must supply their own equipment. NO WATER IS ALLOWED IN THE PIT AREA. Non-racing participants who are cleaning their bikes are asked to keep the water and mud off the tarmac road surfaces. Commissaries and marshals located in the pits will ensure that only authorised persons are allowed inside. On site, signage will reflect that there is no parking adjacent to the pit area. A Road closed sign will be placed at the school exit, preventing access to pit area. Podium prizes for men and women will be equal ammounts. Please note on the day there will be podium presentations for the top 3 only in each category listed below. Prizes for fourth places and below will be made available at the end of the race at signing on and must be signed for before they are released. You are only eligible to collect one prize, whichever is the highest monetary value. Prizes for Under 8s,10s and 12s will be trophies generously supplied by Islabikes and medals provided by Northern Automotive Systems. There will be team prizes for the respective clubs which will be paid after the event. These prizes have been donated by S A Partners.